Todd is passionate about getting students out of their comfort zones in both immersive developing world destinations as well as in remote and transformative wilderness environments. Todd has been an Expedition Leader on Youth trips to Thailand, Costa Rica, and Peru and has accompanied blind and visually impaired students down the Colorado River through the Grand Canyon. Todd has called Colorado home his entire life and graduated from the University of Colorado with a Marketing degree and a minor in Tourism Management. He has been working in the field of educational youth travel for the past six years. Prior to that he owned and managed his own photography business and was primarily a photojournalist. From inspiring students at conferences, to connecting with passionate educators worldwide, Todd thrives when he is outreaching to schools and groups eager for transformative experiences in the US or abroad. 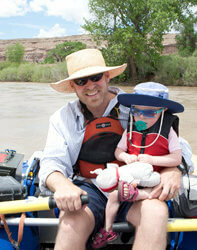 Todd lives in Fort Collins with his two girls and is regularly on the river or cycling through the backcountry.